Inline skating lessons are the quickest way to improve and learn skating correctly. 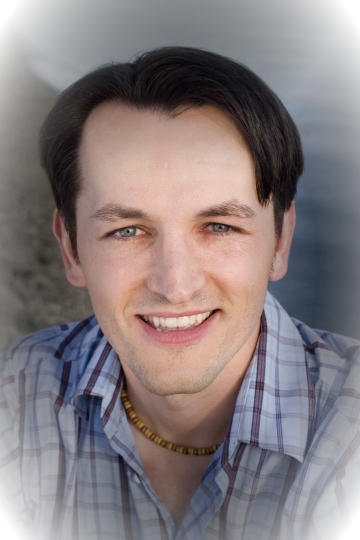 They get you focused personal attention and the best quality instruction in Vancouver. Simply organize your group of 4 people for a total cost of $100 for 2 hours. If you are single, join our 2 hour group beginner or intermediate lesson. Our skate school is committed to providing year-round quality instruction to people of all skill levels. Jan has been skating ever since he learned to ice skate in Prague, Czech Republic when he was five years old. Specializing in recreational, fitness and speed skating. Whether your goal is to skate around Stanley Park or skate a marathon, a lesson will give you confidence to skate safely with good technique. 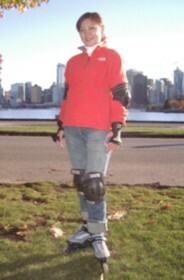 As seen in The Canadian Press, Jan has been inline skating in Vancouver for the past 20 years. 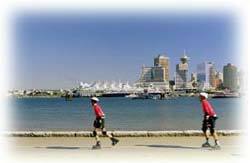 His favourite places to inline skate are the Stanley Park Seawall, from English Bay to Science World and the 10km Seymour Valley Trail on the North Shore for fitness, speed and endurance. For an advanced private lesson, select your goal and choose your desired outcome? • How to skate down a hill without killing yourself? • 180 Degree Transitions: switching from forward to backwards and vice versa. • Learn to stop faster (One-Footed Heel Brake) and with more confidence. • Improve skating efficiency and speed — Stride II and III. *** Learning all the skating drills in each 2 hour class depends on student progression. Any 2 hour lesson can be arranged to teach any specific skill a student wants to learn. For example, Hockey Lunge Turn, Heel-Toe Roll, Double Toe Roll, 180 degree jump turn, Grapevine or Crazy Legs. Lessons are available anytime during both weekdays and weekends, based on our agreed upon schedule. Call 604-603-5126. Book in advance to avoid disappointment. Book by email to be notified for the next group beginner or intermediate lesson. Give us your preferred date when you would be available and we'll schedule a group. Lesson done. Students now know how to practice safely with confidence. Spectacular lesson done. Stopping, turning, skating in control, braking easily. Beautiful lesson! Balancing, turning and natural high confidence booster! Great balance with more control. Definitely more confidence! Superb lesson done. As a student said in his own words, "Great class, thanks for everything. Let me know when you have an intermediate class - I'll be practicing in the meantime". Awesome lesson done. Duck walk, balance drills, A-turns, Snow plow, plus more! Another amazing lesson! Balancing, turning and stopping! Great intermediate lesson done. Done advanced balance drills, improved skating technique, forward propulsion, stopping faster, parallel turns and T-Stop. Fantastic intermediate lesson done. Greater confidence and skating in control. Advanced braking technique, advanced swizzles, efficient skating technique, plus more. Group intermediate lesson done. Done T-dragging and stopping, advanced heel brake stop, skating technique, crossovers with underpush drills, plus more. Lesson done. Discover how easy it is to stop like a pro on a hill! Super intermediate lesson done. Skating efficiently, stopping on hills, advanced braking technique, skating in control with multiple balance drills. Incredible lesson done. Rave reviews with new confidence. 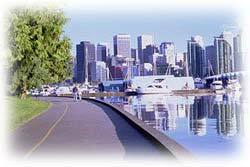 Our roller blading lessons are taught almost exclusively in Downtown Vancouver. near Lonsdale Quay Seabus terminal at Waterfront Park or in West Vancouver near 17th & Marine. scheduled in several dry locations. Call 604-603-5126 for info. Would you like to learn to inline skate in a fun group environment? If you are single, join our 2 hour Group Beginner $35 each (3-6 people) or Group Intermediate Lessons. Don't have skates? Rollerblade skate rentals and protective gear for only $15-17. PLEASE READ - All rollerblading lessons can be reserved and paid in advance by CASH or online through PayPal. If you cancel 24 hours in advance you will receive a refund minus a $10 handling fee. If you cancel within 24 hours or do not show up for the lesson - you will be charged in full. Extra time will not be made up if you are late for the lesson. If you are late, we will wait for 20 minutes and if you do not show in that time you will be charged in full. All Extreme Confidence Value Packages must be used within 5 months. Value Packages cannot be transferred. No refunds on unused lesson(s). Prices do not include rental or any expenses incurred with taking a lesson. All protective gear (knee, elbow & wrist pads) including a helmet must be worn. A waiver must be signed if all protective gear is not worn. Online, Travel the World & Be a Global Investor.